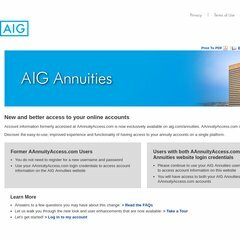 aannuityaccess.com Policy Access System - Provided by Western National Life Insurance .. The estimated 105 daily visitors, each view 5.40 pages on average. The server is hosted by American General Corporation (Texas, Houston.) Its IP Number is 161.159.248.160. It has 6 nameservers, including ns3.aig.com, ns6.aig.com, and ns4.aig.com. Website load time is 1375 milliseconds, less than 52% of other measured websites.